Alice M. Thomas, 74, of Burlington, passed away Wednesday, February 6, 2019 at Aurora Medical Center in Burlington. Born July 4, 1944 in Chicago, Illinois, she was the daughter of Philip and Lucille (nee McMann) Rinda. She spent her early life in Spring Grove, Illinois where she attended Richmond High School. On July 29, 1961, Alice was united in marriage to Ronald Fout. He passed away on January 15, 1969. On October 9, 1971, she married Richard Thomas. He passed away on August 2, 2002. She has been with her significant other, Walter Emrich, for 10 years. Alice was a homemaker, and always willing to help others with their housework. In her early years, she was a member of St. Peter’s Catholic Church in Spring Grove, Illinois. 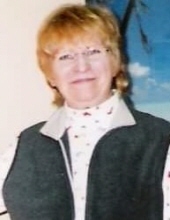 She was also a member of the Lake County Chaper of Sweet Adeline’s in the 1980’s. She enjoyed boat rides and fishing, and was a natural caregiver, always taking care of others. Alice is survived by her children, Tammy (Leonard) Carlson and Bonnie (Bruce) Parsons; grandchildren, Leonard Carlson, Angel Carlson, Alex Carlson, Chuck (Taryn) Vrasich, Anthony (Jessica Sasman) Vrasich and Melanie Vrasich; great-grandchildren, Sophia, Logan and Olivia; and brother, Thomas (Mary) Rinda. She was preceded in death by her parents, husbands, sister, Lucille, and brothers, John, George, Phil and Buddy. The family would like to thank Dr. Twarty, nurses and staff at the Vince Lombardi Cancer Clinic in Burlington, the nurses and doctors of Burlington Hospital and Aurora at Home Hospice for their care of Alice during her battle with cancer. Memorial contributions may be made to the Vince Lombardi Cancer Center or Aurora At Home Hospice. A visitation for Alice will be held on Saturday, February 23, 2019 from 12:00 PM until 2:00 PM at Schuette-Daniels Funeral Home. A private burial will be held at a later date at Ringwood Cemetery. To send flowers or a remembrance gift to the family of Alice M. Thomas, please visit our Tribute Store. "Email Address" would like to share the life celebration of Alice M. Thomas. Click on the "link" to go to share a favorite memory or leave a condolence message for the family.